The final poster for the first part of the The Hunger Games: Mockingjay films hit the web yesterday. This time we see Katniss front on. The last poster also featured Katniss but that was from the back. This time we see her dressed as a rebel with the Mockingjay logo behind her. Well, some of it at least. Only the wings are visible that gives us the idea that she is an angel. The angel motif seems to be prevalent in the all of the posters for the film. I don’t like it. I don’t think of her as an angel. More of the wrong person in the right place at the right time. The rebels need a figurehead and with what she has been trough and what she gave to the Districts through is what they are playing on. She is heavily scared by her two times in the games. The love of her life, well one of them at least, has been captured and she doesn’t know what has become of him. For us who have read the books we do know. It’s not a good thing. The angel motif, especially in this one, is poured on like syrup on a pancake. A little bit too heavily. 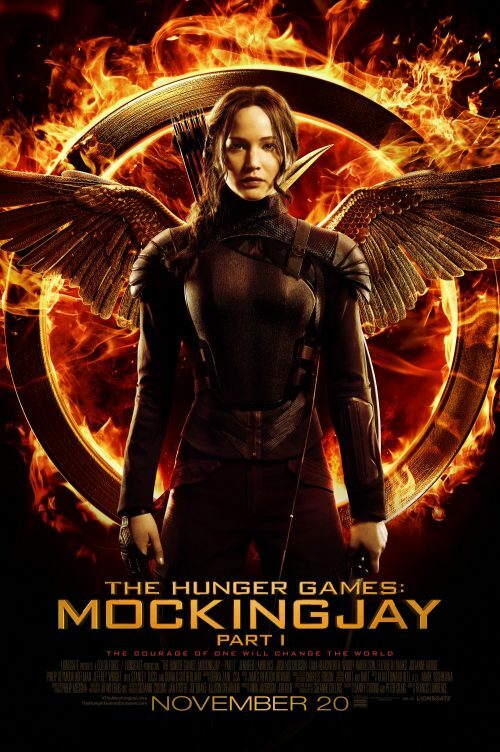 I don;t know what I would do as the logo and Katniss goes hand in hand throughout. This poster is the lead to the new trailer that launches in four days time. The teaser that was launched some time ago was great to wet your appetite. What we need to know is how far into the book the first part will go. I have my ideas. I think that will be brought out in the trailer. I just hope that the trailers for the second part won;t give away one of the most traumatic aspects of all of the books – You will know what I mean if you have read them all. One life our heroine couldn’t save!